"...In 2016 and 2017 we commissioned independent surveys of our customers from across various industries and locations. The resulting testimonials were freely given and recorded. If you would like to see the full documentation relating to the testimonials please call us to arrange to visit and view the associated files. It is our sincere belief that we do go the extra mile for our customers believing that to do so will benefit both of us over the long term." "It does not matter which salesperson you deal with they are all consistent in their product knowledge and personable manner, the price and the quality of the products are the best you can get." "Brilliant after sales service, put through to the right person for the right thing at the right time, they try everything they can to help. Thank you; keep up the good service you offer." "Very happy with service - Thank you." "A local, reliable, good service, you can take the machine in and just say help – they understand the urgency, they are very obliging and really pleasant to deal with." "...Good professional, helpful attitude towards any problems/queries I have." "I chose Weyfringe because of their locality and after sales service, good to deal with, they even left the machine with me for a day to try out, they are good to negotiate with, very accommodating." "Friendly, professional, good service. Salesman had a good product knowledge, and they actually left the kit for us to try." "I inherited my Weyfringe printer from the previous owner - it's a great service I feel fully supported at all times, they are very tight on order control, they take orders promptly, I like that and they confirm the order back to you, this enables me to double check I have not forgotten anything. They are so easy to get along with, anything that I can't provide for my customers I can throw at them and they will always come up with a solution. My sales rep is very nice and I have found the support Weyfringe has offered me is better than a similar company based locally. You can talk through most things on the phone and if the sales rep has not heard from me for a while he will phone to check I am okay and call in personally when he's in the area." "Really helpful, knowledgeable and has helped us a lot with labels for our new contract with two major automobile manufacturers"
"Weyfringe provide me with cost reductions and improved efficiency, they are very helpful and I would have no hesitations in recommending them or doing business with them again"
"Very happy with them, they did exactly what they said they were going to do. We got two machines fixed and because of the quality service we decided to get the third one fixed too." "Very helpful, we are very pleased with all the help we have received would certainly buy from Weyfringe again"
"They are handy and local, technical back up is very good, they always do what they say they are going to do and follow through keeping you updated at all times"
"I chose to buy from Weyfringe because of their on site demonstration, I also found them to be competitive on price, they are very supportive the main benefit Weyfringe Labelling Systems provides me with is it enables me to go meet a new legislation requirement and my labels look even better, so good for marketing too!" "Weyfringe even allowed us to trial our work on their applicator before we bought it! They were just great." "They offer a good service, are keen to respond and reliable. They are also good at communication as they always get back to you straight away." "Customer Service is fantastic - you have a personal relationship it's a pleasurable experience not just a business transaction - it's the attitude of the people who work there that sell the business." "Good demonstration before we bought, they can provide you with a bespoke specification, and they offer fantastic customer service"
"They provide me with exactly what I want, as they offer a bespoke service." "We really like dealing with Weyfringe because they offer such great quality and good service, would not go anywhere else"
"We chose Weyfringe because they had the best offer, offered a demonstration, and we really liked the product. They provide good service, your order is always on time and any problem you can just give them a call." "We chose Weyfringe because they were recommended to us by two of their other delighted customers. We were not disappointed. Thanks for all your help; your product solved our problem." "The best thing about Weyfringe is that they are reliable and efficient; we are a busy company and whatever we ask them for we know it gets done, without having to follow up." "We chose Weyfringe because we felt their machines were more economical and reliable than any other we looked at. The demonstration they gave us was excellent it covered maintenance and there was lots of really helpful background information given too. The representative was extremely helpful. We have a very good working relationship with Weyfringe." "The staff are lovely and really pleasant; they really listen to what you want and are very helpful." "What I liked about Weyfringe is that they did not do a 'Hard Sell' they really listened and were extremely personable. I was astounded when I got an after sales call, it was so unexpected, a really nice touch, they deliver what they promise." "I just wanted to contact you to praise a member of your staff, who has been a great help to me this morning and indeed whenever I need to contact your company. He has just talked me through a complicated procedure with the utmost of ease and not made me feel useless with computers. I am sure that customers are very quick to complain but I wanted to let you know how happy we are with the service from yourselves." "Weyfringe try to be as helpful as possible, and their products are reasonably priced. Their after sales service is very good, we would definitlely buy from Weyfringe again." "We are really happy with our printer we bought from Weyfringe not only is it very efficient, it looks very smart too! Great company. Great Service." "I found the Weyfringe representative very knowledgeable and I am really happy with the after sales service and support as they are there like a shot if you need help." "I liked the fact that Weyfringe come and demonstrate the product rather than for example just say it's on page seven, very helpful in setting it up and ensuring it was working, we would definitely buy from Weyfringe again, it's a proven product." "We are more than happy with everything.."
"We have built a good relationship." "We found the Weyfringe representative very helpful, a very personable chap and approachable, even if he did not know something he would make sure he found out. Our old system was bought from Weyfringe and has lasted us very well, the new system provided us with information linked to the PC and we liked that. Our Weyfringe labelling system provides us with traceability, due diligence and proof that things are monitored." "Weyfringe are a really good company, they offer us continuity, they do a great job, when it comes to after sales support and service - you can speak to the person you dealt with very easily, they are always happy to come out and speak to you in person. They are prepared to go that extra mile." "A few weeks ago I inherited one of your products of which I had no knowledge what so ever. I was put into contact with your technical services department and the assistance given to me was second to none, not only in knowledge but patience as well. We decided to purchase another printer and there was no hesitation in getting a replacement from your company. You visited our site to install the machine and your manner and knowledge was superb. My thanks to your staff for a job well done." "...The product quality is excellent and the service is faultless"
"Many thanks for your help, I have found your company really easy to use and all very helpful and friendly! And we LOVE our label printer!" "...Thank you for a great service"
"I just wanted to say how good Weyfringe service is. Technical Support were brilliant and you have been wonderful. Just wanted to say a big thank you." "...Knowledgeable and offered solutions to our needs." "Excellent, friendly, efficient service from day one. Always happy to help when required. Highly recommended." "Happy with the package, price and service, very good sales man and trainer." 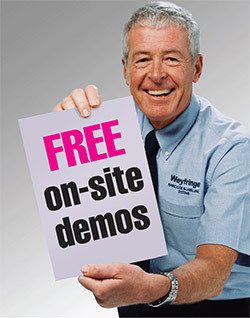 "We found Weyfringe on the internet, we had a free demonstration and found the salesman very helpful. They are very reasonably priced and the labels are very versatile..."
"They are very easy to deal with, the contact is very prompt, we are very happy with their service." "They offer a one stop shop for all your needs, as they offer the whole package, very good, competitive price, they are very reliable and the sales team are very helpful when you call them!" "Demonstration was extremely helpful, offering this service was their unique selling point for us. They are quick to respond and keep you informed and you always get a positive response from them." "Always willing to help and get orders out quickly"
"Cheaper than other suppliers and supply things quickly, they have excellent product knowledge, offer good advice; they are very helpful and also local!" "Nice, helpful, informative yet professional company, label prices are very competitive, their after sales service is fantastic. Their product has helped us modernise and streamline our system and also adheres to the legal requirements for our product." "Weyfringe offer flexibility with regards to size, formats and languages, they have many angles." "They are our preferred supplier and very competitive on price, quality is perfect, everybody is helpful and you get a quick response." "We are very happy dealing with Weyfringe because they offer an integrated process, a cost effective solution and are more competitive than other companies." "Weyfringe are prompt on delivery, competitive on price and very helpful and professional." "Their after sales service is excellent; they are consistent, reliable, cost effective and flexible." "Very happy with the service we receive." "Great customer service and product range." "We chose to buy from Weyfringe because they offer a good service, price and are a good fit for our business, I am planning on sending more business their way as we now have a new product, essentially they do what it says on the tin!" "I chose them because of their product availability and price. I have recommended them as a great supplier to other companies I work with." "They are reliable and excellent!" "Always help when I am in a hurry, I have a good relationship with them. Tried another supplier once but nowhere near as good as Weyfringe. They offer good quality and are ultimate professionals. I have now been dealing with them for many years and hope to continue for many more!" "We have a great relationship with them, their product knowledge is excellent." "We have always had fantastic service." "Efficient & friendly service - Never any issues with goods and delivery." "Quick and easy installation. Gret support offerred with technical issues raised." "Great sales staff, enthusiastic & knowledgeable." "Recent urgent order handled very well, with an extremely helpful delivery date." "We are very happy with all aspects of service"
"Good professional service, friendly and knowledgeable staff." "Everyone at Weyfringe is professional, personable, knowledgeable, friendly and always willing to help. I would recommend Weyfringe and would always contact them with any queries or projects we may have." "Lovely service, felt confident after training""
"Great service and advice on products""
"Our contact is very kind, helps promptly with our orders and any queries""
"Very good communication and friendly service"